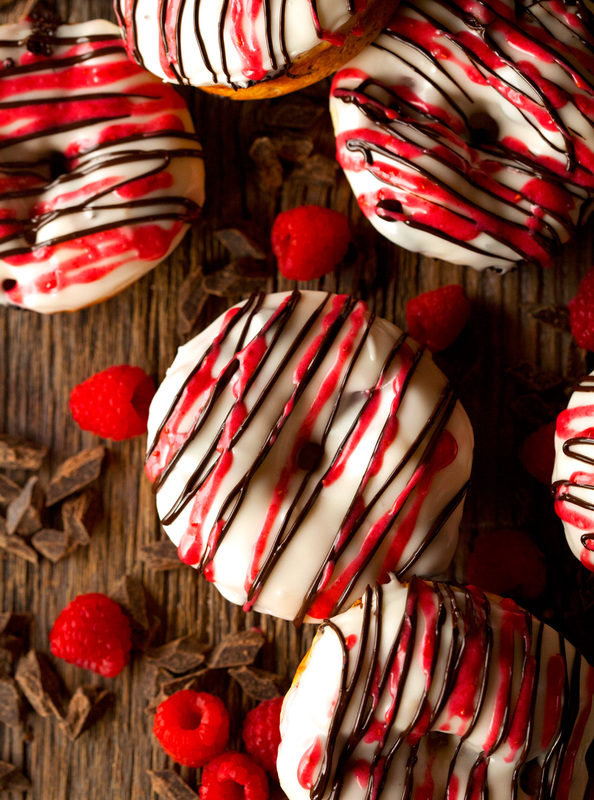 Are you ready for a blast of dark chocolate, raspberries and doughnuts? Good. You are about to find out the best way to enjoy all three! As I am typing this post, we are getting ready for a road trip to Kansas, helping my brother-in-law move. I just love a good road trip and can’t wait see what this weekend has in store for us, even though there’s a little bit of work involved, ha. Since our MN summer has been lacking the hot temperatures that are normal for this time of year, I am beyond elated to be heading somewhere hot and humid. While temperatures in the high 70’s make for a comfortable summer for most people, the summer lover in me cannot wait to finally break a sweat. One good thing about the “low” temps is that I haven’t had a reason not to turn on my oven. I’ve been happily baking away lately. Eating sweet treats and going for a run in gorgeous weather…. does it get much better than this? Actually, yes. Eating doughnuts without having to work out would be even more amazing, but we’re talking about reality here. There’s no greater motivator than finishing my run when these fluffy doughnuts of wonderfulness are awaiting me. It’s the biggest reason why I work out. Kathi loves food just too much, especially doughnuts. 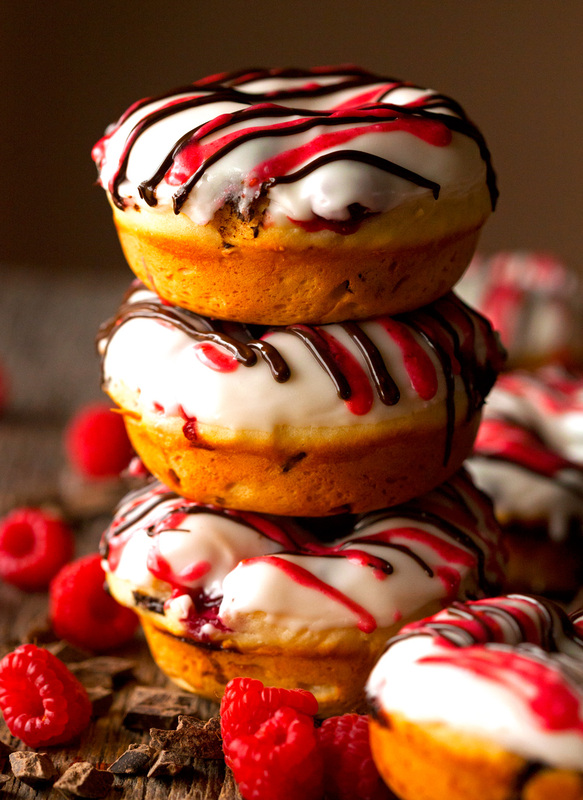 Best Ever Glazed Dark Chocolate & Raspberry Doughnuts to be exact! Want to know the reason why these doughnuts deserve the title of best ever? They’re baked, but unlike most baked doughnuts, you would never guess that they were not fried. It’s da truth. The secret is all about letting the dough rise for a couple of hours. I know – there’s yeast involved, but don’t be dismayed, you will be able to pull them off. Soft, moist and utterly scrumptious doughnuts are worth it. You won’t regret tackling this project. Plus, it’s easier than you think. Pinky promise. Seriously, if you adore doughnuts even half as much as I do, there’s no question about whether or not you should make them. Just wait until you see the finished product. You get double points if you manage to take a bite filled with both a piece of chocolate and a raspberry :). Especially if they’re still somewhat warm inside. 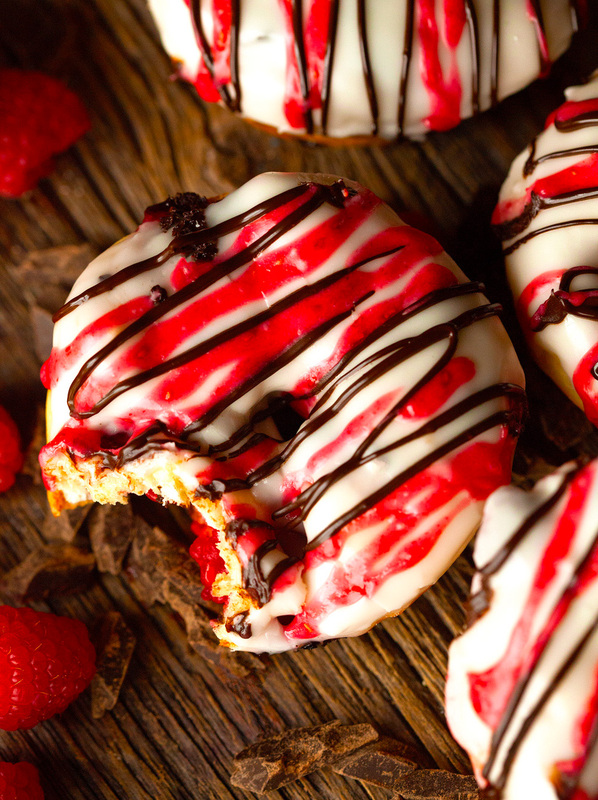 Juicy raspberries combined with melty chocolate inside a homemade doughnut. Can you say yum? Good thing there are still two left this morning. The only thing better than a road trip must be a road trip with doughnut in hand. Alright, friends. I hope you all have something fun planned this weekend. And if not, there are always doughnuts :). You need this doughnut recipe in your recipe box. Best ever is no exaggeration when it comes to these doughnuts. You will make them over and over again. 1. In the bowl of your stand mixer, combine warm water and yeast. Let stand for 10-15 minutes, or until foamy. 2. Using the paddle attachment, add milk, egg, sugar, and butter. Add salt and flour and mix until a sticky dough forms. Cover bowl with a clean kitchen towel. Let rise at room temperature for 2 hours. After the 2 hours have elapsed, place bowl in the fridge for 1 hour. 3. Preheat oven to 350 degrees F. Grease a doughnut pan with nonstick spray. Gently fold chocolate chunks and raspberries into the dough. Pipe or spoon batter into the wells of the doughnut pan. Bake for 18-20 minutes or until doughnuts are golden brown. Remove doughnuts from the pan and place on wire racks to cool slightly. 4. Meanwhile, prepare the glaze. In a small saucepan over medium-low heat, whisk together confectioners' sugar, milk, and vanilla. Glaze should be heated through, but doesn't need to come to a boil. Remove from heat. Dip warm doughnuts into the glaze and return to wire racks to cool. 5. Add pureed raspberries to the remaining glaze and mix until fully combined. If the glaze seems to be too runny, add another tablespoon or two of confectioners' sugar. 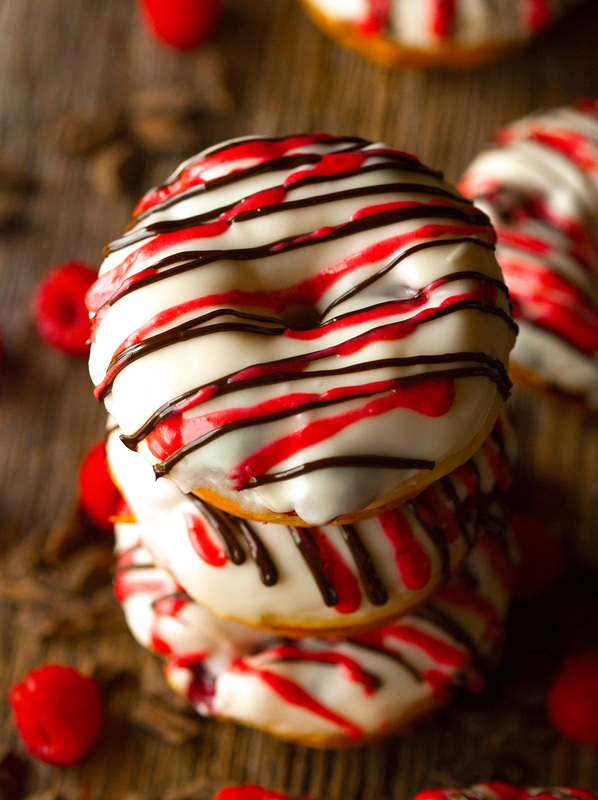 Spoon raspberry glaze into a ziptop bag, cut off one corner and pipe over doughnuts. Lastly, melt dark chocolate, spoon into another ziptop bag, cut off one corner and pipe over doughnuts. Let sit for 5 minutes and enjoy. Doughnuts are best when eaten on the same day, but will keep up to 3 days stored in an airtight container. Hi Alison, thank you so much for reading!!! I’m so sorry I’m getting back to you just now. We had a pretty busy couple of days ;). Visiting Kansas was so much fun – we drove all the way to Manhattan, actually. If you have some recommendations, I’d love to hear. We’ll be back visiting again soon. Thank you! These look amazing! Love the flavor combo here Kathy! Oh wow – these look amazing! Definitely a recipe for me to save for treat day. Ha! Definitely – hope you enjoy, dear! Wow! I would have guessed that these donuts were fried and not baked, Kathi! So puffy and perfectly glazed. And let’s talk about that flavor combination. Dark chocolate and raspberry? YUM! I’ll definitely be trying these soon – hot, humid weather and all! Ha! Thanks, Alyssa. You won’t regret turning on your oven for these ;). 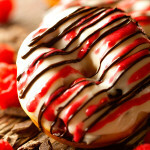 i am so craving a donut right now.. these look delicious, and that glaze i could totally deovur by the bowlful! I could go for a donut any time of the day! Thank you so much, Thalia! Oh my, these look amazing. I love the drizzle of chocolate on top and that thick layer of icing, yum!! These look so beautiful and tasty Kathi! The combination of raspberries and chocolate is divine! Thank you, Shiran. Chocolate and raspberries go so well together and make for a yummy treat! These donuts look beautiful, Kathi! And super delicious, too! 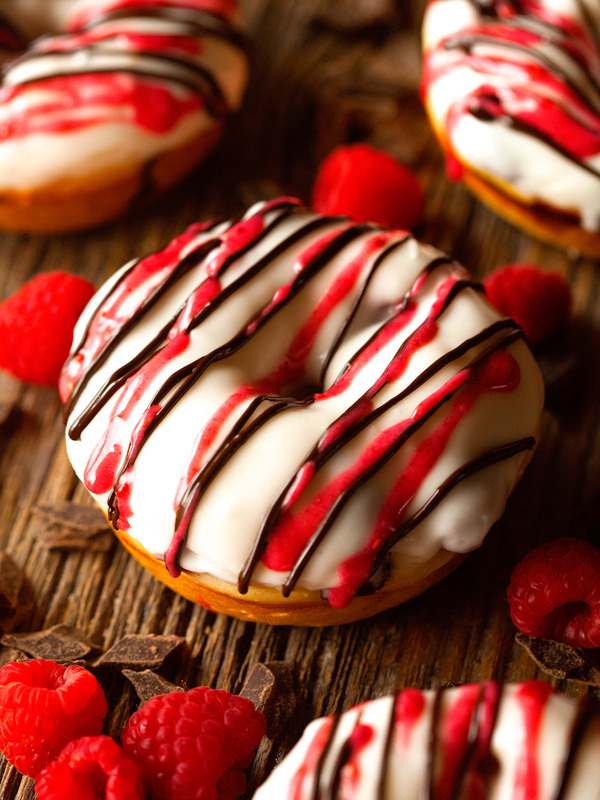 I love that you used dark chocolate for the glaze, goes perfectly with raspberries! Pinned! It sure does. Thank you, Gayle! Kathi, these look incredible! They’re definitely worth any amount of running to get to enjoy these babies at the end. We do need to talk about your love of warm temperatures, though. 70s year-round is the best! Who needs the heat when you can have a nice mild warmth?? They definitely are. It’s all the motivation I need ;). I just can’t help it – I am a sun and heat lover!! Has anyone ever told you that they are in love with your doughnuts? I certainly am! You are too sweet for words, Jocelyn. Thank you!! These are some beautiful doughnuts! I love the flavor combo – pinned! Awww, thanks Cindy. Hope you’re having a great week!! Whoa, these doughnuts look epic, Kathi! Love love love that gorgeous glaze and the flavors sound amazing! Seriously wish I had some right now! I love, love, love your comment :). Thank you so much, Kelly! Doughnuts are my love language! They just make me so happy. This version makes me speechless. 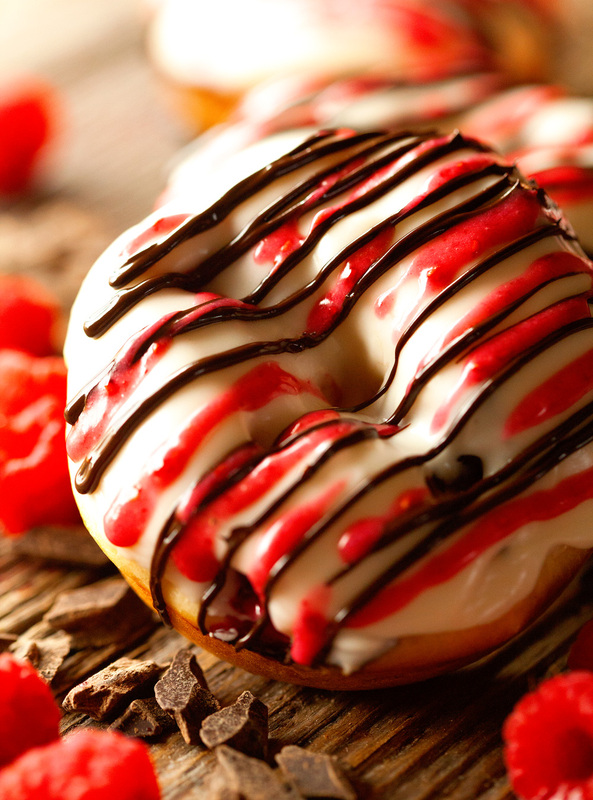 Dark chocolate + raspberry…one of the best combos ever. And on a doughnut, even better! I am so excited to try these! I just bought some doughnut pans yesterday and I think this will be the recipe to try them out with!